The Orville Parker farm in rural Kandiyohi County was listed among the century farm honorees recently. The 80-acre farm was registered in St. Cloud on Nov. 18, 1872. Today, there are only 40 acres left of the original farm, and only 11 acres are still cultivated. Mary Niemczyk, Blaine, is the fourth generation to own the farm homesteaded by her great-grandfather. The farm is presently in trust for her son, Mark. 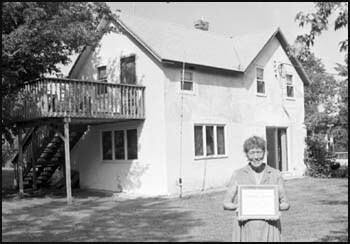 Niemcyzk bought the farm from her mother, Alwelda Strus, in 1976. “Orville came to Minnesota from New York. He traveled by train to Chicago. The family lived at Watkins, Ill., for a year before moving to Minne-sota by means of ox carts,” Niemczyk said. Parker’s obituary said he arrived in Roseville Township, Kandiyohi County, at that time Monongalia County, which had been his home prior to his death. “Stories passed down from one generation to another tell how the Indians taught him how to hunt and fish,” she added. The Niemczyk family finds the farm a quiet place to retreat.